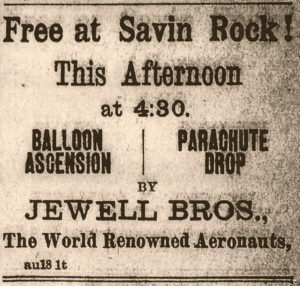 September 15, 1893, was a perfect late summer afternoon at Savin Rock, where crowds had gathered to see “Prince Leo – The Boy Aeronaut”, perform a balloon ascension and parachute drop. Leo was sixteen, and had been giving such exhibitions for the past three years. At the appointed time, the balloon was released and quickly rose to three-hundred feet where a fabric panel suddenly failed and allowed the buoyant gas to escape. The craft plummeted, and crashed into the top of a tree located next to live electrical wires. The impact threw Leo onto the wires where he was severely jolted before falling to the ground. He was badly cut and in shock, but he would survive, and would later go on to become one of the world’s best known aeronauts while performing under his real name; Albert Leo Stevens. Much has been written about the former amusement park at Savin Rock, but it seems that little attention has been given to the aeronautical exhibitions designed to draw visitors to the well known resort. There was a time when balloon ascensions drew large crowds, and in the mid 1800s, due to their novelty, simply watching one ascend was enough to satisfy. However, as time when on, “aeronauts” were obligated to perform greater feats of daring such as leaping from balloons using parachutes. Some performers took it a step further by jumping with two or more parachutes, cutting away from one, free-falling, then deploying another. And still others would be shot from a tube or “cannon” suspended beneath the balloon. Balloon ascensions at Savin Rock began in the late1880s, with the vast majority taking place without incident. Those that failed made headlines, which at times drew larger crowds to the next scheduled event. A case in point was one of the earliest recorded ascensions to be made from Savin Rock. On the afternoon of August 7, 1889, a man identified as Professor Northup took off from the railroad grove and achieved an altitude of nearly 6,000 feet at which time he dropped using his parachute. The chute opened quickly, but Northup came down in the water of Long Island Sound about 1,200 feet from shore. He wasn’t wearing any type of floatation device, and might have drowned had it not been for a passing boat that came to his rescue. Another aeronaut to perform at Savin Rock was Miss Louise Bates, one of the few female aeronauts of the day. 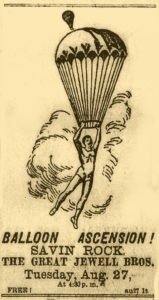 On July 25, 1894, she was to perform a high-altitude parachute drop, but a mooring pole cut the fabric of her balloon as it was released allowing gas to escape. The leak wasn’t realized until the balloon had risen to 150 feet. When it began to fall she leapt clear, but her parachute failed to open. Her fall was broken by the upper branches of a tree where she was rescued miraculously unhurt. The following summer a man calling himself “Daring Donald” had a remarkably similar experience. Fortunately when his chute failed he landed in an area of soft ground. He survived his injuries, and went on to give future performances. Many aeronauts went by the title of “professor”. On July 25, 1903, Professor Dennis Tatneaud’s parachute opened perfectly, but prevailing currents brought him over the water where he splashed-down near the West Haven Jetty. He managed to cling to two oyster stakes until he was rescued one hour later, thoroughly exhausted from his ordeal. However, it wasn’t just mishaps that made the news. August 27, 1903 was the opening of a three-day balloon festival at Savin Rock. One performer was Professor Robert Mack, who soared to the height of a mile before being fired from a “cannon” amidst a blaze of fireworks. He landed safely at the ball fields in what was described as “remarkable ballooning”. The balloon used by Mack was reportedly one of the largest in use at the time. Unfortunately some accidents ended tragically, such as the ascension made by Theodore French on August 17, 1907. When his parachute failed to open he landed atop a piano factory and was killed. By 1908, airships were beginning to replace balloons as a way to draw crowds for they could do things balloons couldn’t. In June of 1908, famous aeronaut Charles Hamilton arrived with his airship and drew quite a bit of attention. On June 13, Hamilton took off from Savin Rock bound for New Haven, and after circling a stadium in that city, had to make an emergency landing on some railroad tracks. After making some repairs, he took off again, but encountered strong winds which blew him out over Long Island Sound. There he was forced to land in the water where he was rescued by a passing boat. 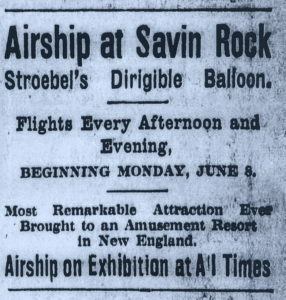 Balloon ascensions continued at Savin Rock at least until 1915. By this time World War I was raging in Europe, and after the war former military pilots took to the “barn storming” circuit which quickly eclipsed balloon ascensions as a way to draw crowds. Waterbury Evening Democrat, (Waterbury, CT.), “Accident and Incident – Daring Donald Falls from Balloon At Savin Rock”, July 24, 1891.